In How to Train Your Dragon, if you can kill a dragon, you are a made man (or woman). HTTYD gives a look at the world of Berk, inhabited by vikings. Vikings usually are thought of as tough minded combatants, and they have to be here. Their little village is constantly raided and decimated by fire-breathing dragons. A young teen by the name of Hiccup (voiced by Jay Baruchel) is the son of village leader and the quintessential Viking Stoick, who leads his people into battle. Hiccup desperately wants to take down and kill a dragon, but his father doesn’t believe him to be physically up to the task. But the youngster is very skilled in weapon crafting, and during a dragon raid one day he sneaks out and is successful in taking down a Night Fury, a breed of dragon that is supposedly the most rare and dangerous. Having an opportunity to eliminate this beast, Hiccup cannot bring himself to do so. Improbably, he and the dragon, eventually known as Toothless, cultivate a strong friendship. Despite their odd alliance, there still is a war being fought, and Hiccup’s people will not take kindly to his newfound friend. 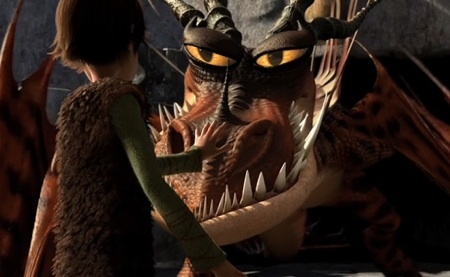 It may not be truly groundbreaking, but that does not change the fact that How to Train Your Dragon from being near the pinnacle of animated cinema. It starts with the story. As alluded to, it may not serve as the most original tale, but the journey is never boring and pretty entertaining. HTTYD does aim to hit emotional wavelengths more so than other similar films, and it succeeds without being too preachy or forceful. Themes such as masculinity, prejudice, and individualism, to name a few, are treated with delicate care. Lastly, the ending is stellar. No spoilers here, but it is simultaneously saddening and uplifting, and a great note to conclude upon. The relationship between Hiccup and Toothless is obviously the core of the movie though, and it is why this simple story is so endearing. To see the unbreakable link transform over the course of 98 minutes is almost impossible not to like and care about. 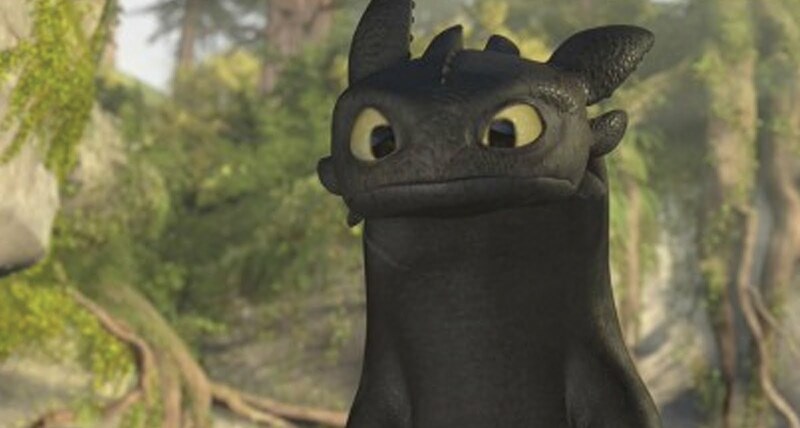 Hiccup is an OK character if a bit cookie-cutter, but Toothless steals the show without saying a word. His facial and body animations all on their own tell everything that needs to be known about any given situation. With all of that said, the real triumph happens to be the breathtaking visuals. Simply put, HTTYD is a technical marvel. Dreamworks has crafted a very lush and crisp world of Berk. I was not able to view this in 3D unfortunately. I find that it often is unnecessary, but after viewing for the first time, I did wish that I had seen it in eye-popping glory, or at least had the option to do so. Amazing cinematography that rivals the best of animated movies and non-animated ones. The effects were so convincing, it is easily forgotten that this is straight animation. There are a few gripes, but they are mostly innocuous and perhaps more based on personal preference. The voices used for various characters are passable, but unnoteworthy. For some reason, Jay Baruchel’s as the voice of Hiccup came off as odd. It is not a huge issue, more like a minor annoyance. Eventually it just becomes accepted. Other featured voice work features America Ferrera, Gerald Butler, Craig Ferguson, and Jonah Hill. They bring enough life to their characters, just not to the point of being memorable. This may be more of a criticism that should be leveled to the characters themselves as opposed to how they sound. Aside from Toothless, Hiccup, and Hiccup’s love interest in Astrid, everyone else is somewhat underdeveloped, cliched, or both. None of it mars the film in a large way though. 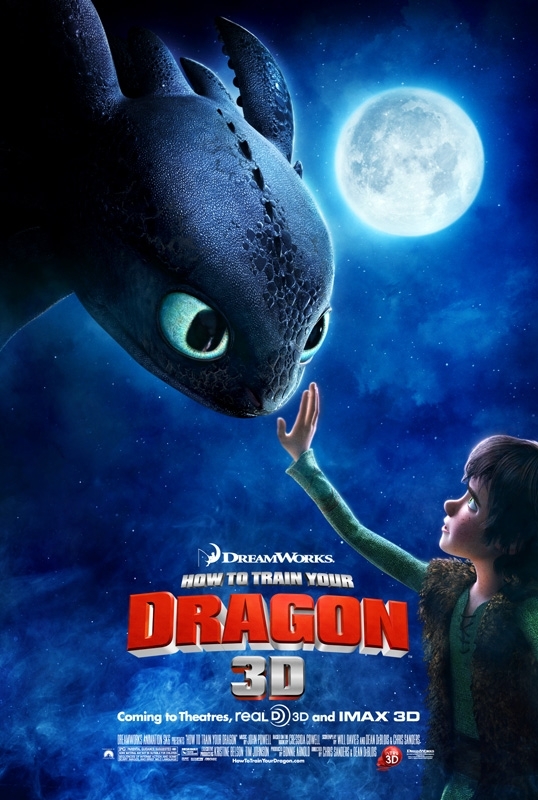 How to Train Your Dragon is one of the better animated films in recent memory, possessing a good deal of emotional depth from a simplistic tale and dazzling technical proficiency to boot. Kids will eat it up, and so will most older children and adults. Photo credits go to collider.com, fanpop.com, culturemob.com, and howtotrainyourdragon.wikia.com. Feel free to follow @MovieManJackson. Sweet, beautiful and thrilling, even for an animated movie. Good review Jackson. Thank you. Days later, I am still thinking about this movie. I still need to see this one Jackson, it sounds great! Definitely recommended. It has such an irresistible charm. Sounds much better I thought it would be! I have not watched it but may just have to since a sequel is on its way! It sounds like a beauty to witness and I do hope that I get around to it! Big name voice-overs as well! Highly recommended CriticMan! If you are checking out the sequel, you must see this! NextMy Acceptance of the Liebster Award!